Transcending all previous generations of adhesives, Ninja Glue HY by American Acrylic Adhesives, LLC, is the market’s first truly hybrid glue designed for solid and hybrid surfaces. Developed and formulated by fabricators, for fabricators, Ninja Glue represents all you want in an adhesive, employing cutting-edge technologies to provide the lowest-viscosity surface glue. Designed for maximum performance, it features the flow-ability fabricators require and the dripless features they demand. Semi-dripless features ensure it is easy to dispense, enabling it to seamlessly spread and adhere without running or dripping like traditional glues. It is highly UV-stable, non-yellowing, and resistant to staining, water penetration, impact, scuffing and wear-and-tear. 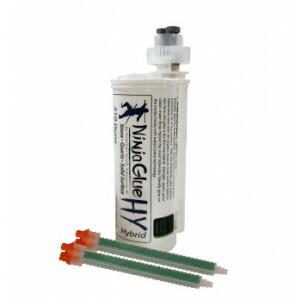 Ninja Glue HY offers an unparalleled selection of colors and is quite simply the most versatile glue out there: It dries with a matte finish yet can also be polished, and bonded pieces may be sanded, routed and finished as desired. Powerful. Effective. Nearly undetectable. Like a Ninja!